Glasgow is a city in Scotland once famous for its industry, with iron and steel works, which dominated the area, giving it something of a drab and gloomy reputation. Nowadays, it has successfully rid itself of this stigma, and as Scotland’s largest city, it is now accredited with being the country’s cultural capital. The name of the city reflects its Celtic past, derived as it is from the old Gaelic words for ‘green hollow’. The town’s history is evident from its streets; the northeastern part of the city is known as Medieval Glasgow and is home to the 12th century Cathedral of St. Kentigern, where St. Mungo arrived some 1,400 years earlier to build a church and whose grave can be visited here. On site, you’ll find the Necropolis, one of the UK’s biggest Victorian cemeteries, which can be visited by crossing the Bridge of Sighs. 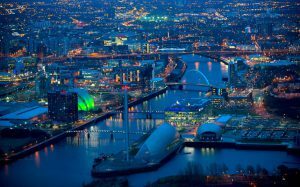 Also nearby is Glasgow Green, a public park which opens onto the River Clyde and is popular with residents and visitors alike. When visitors have had their fair share of history, they might want to head for the nearby Botanic Gardens; this 40-acre facility is renowned for its stunning begonias and orchids. Also nearby is Linn Park, offering 212 acres of pine and woodlands, and presenting visitors with the opportunity for pleasant scenic riverside walks as well as a handful of small attractions including pony rides, an old snuff mill and a children’s zoo. Alternatively, you can take a short drive to Prestwyck where sandy beaches, vibrant green golf courses and the scenery of Ayr Bay and the Isle of Arran awaits you. In the town itself, visitors will find no shortage of amenities. For accommodation, there are choices to suit every budget with everything from mid-range B&Bs to expensive hotels; while the city’s restaurants cover all options, from fast food to haute cuisine.